Tired of the same old balsamic dressing or just a drizzle of lemon juice on your greens? Me too! I am constantly looking for variety in my dressings, but most recipes I’ve seen include a ton of oil, and I don’t want to add a lot of oils to my salad. It sort of defeats the purpose of a healthy meal and doesn’t taste as fresh as I want it to. Simultaneously, I want my salads or buddha bowls to taste flavorful and satisfying every time I make one. My favorite thing is to just throw a lot of vegetables, tofu or tempeh I have in my fridge, and/or add some grains, beans or lentils from my pantry in to a bowl and make a delicious dressing to drizzle over it, and my meal is complete. It’s cheap, quick and very satisfying. I will spend a few hours on Sunday afternoon/evening cooking a bunch of ingredients for the week so they can quickly be combined in tupperware containers to go. So do I use any oil at all in my diet? Yes and no. Vegetable oils, particularly, I stay clear of (which are not made from “vegetables” at all). I am referring to processed seed oils like soybean oil, sunflower oil, corn oil, canola oil, cottonseed oil, safflower oil and a few others. They typically contain a large amount of trans fats, and can contribute to inflammation and cardiovascular disease. I will go more into detail of the negative aspects of vegetable oil in a later blog post. I am not saying that all oil is bad. Really high quality extra virgin olive oil can be great, as is coconut oil, and I use these sparingly in my food. Coconut oil has in fact proved to be quite good for health. Medium chained fats, like those found in coconut oils, are promoted for their ability to increase energy expenditure and to improve appetite satisfaction—resulting in weight loss. That being said, with everything else I eat that sometimes also contain fat, I try to monitor my intake on a regular basis. 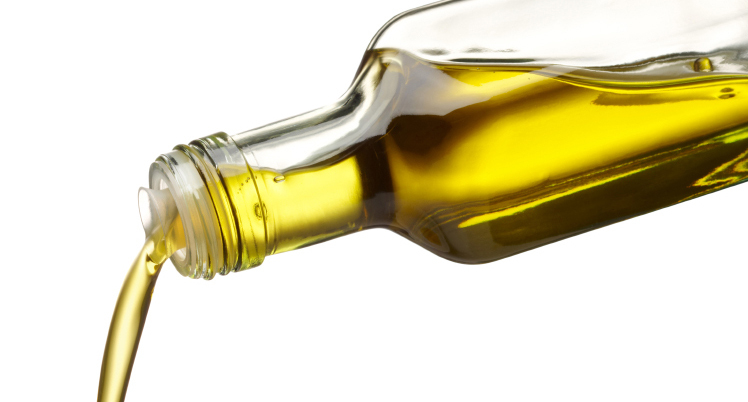 If you want to read more about oils you should definitely avoid, check out Food Babe’s great article here. Back to my dressings! 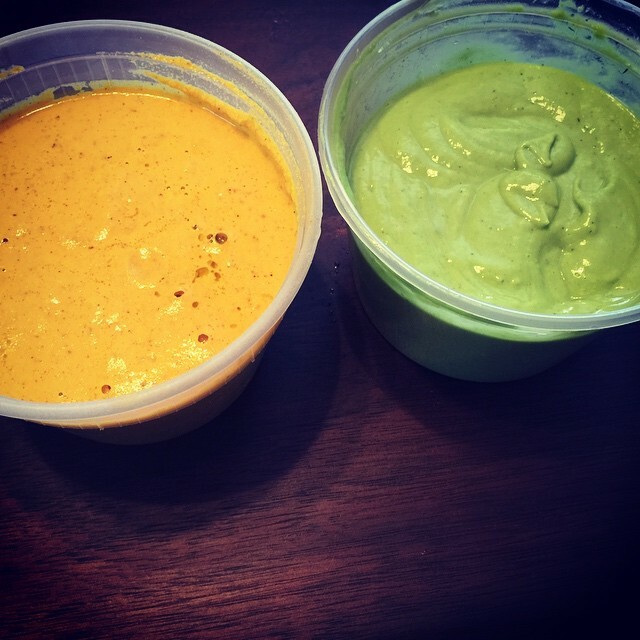 Yesterday morning before heading into work, I made a carrot-ginger-cumin dressing which has a Moroccan spice accent, as well as a creamy avocado-lemon-parsley dressing. I love the bright colors, but most of all I loved how they came out! Oil was not missed at all. Flavor packed and SO fresh – any bottled dressing don’t stand a chance next to these, I guarantee it! Both were inspired by several amazing vegan websites I follow, and I added a personal touch to them. You can play around with what you put in, but hopefully this will give you some great ideas for your next salad. You can add a little less water to these dressings and use them as dips – both options taste awesome! Using a high powered blender, puree all the ingredients Taste and add extra vinegar if you wish, and season with additional salt and pepper, if desired. Makes about 1 1/4 cups. Place all ingredients except water in the bowl of a food processor or a high-speed blender. With the blade running, slowly add the water. Puree until smooth. If you don’t mind oil, you can also include either extra virgin olive oil or avocado oil in here (about 1 tbsp) for an ever thicker and creamier version, but it really does not need it!